Works with Apple and Linux. Good sign up bonus terms. Good refer a friend bonus. Unstable software and bad layout. E-mail support should be faster. 24hPoker has had a rapid growth in 2004 and 2005 due to many TV advertisements. This is a poker room which should be recommended mainly to Apple and Linux fans who wish to play in a WSOP or EPT qualifier. This room has its flaws in terms of low traffic and quite unstable software. On the bright side, there’s a lot of soft competition even at higher stakes. Additionally, a Scandinavian poker variant called Soko, is offered as well. Unfortunately, you will find most of the action in the No Limit tables in the world of Texas Hold’em, but if that’s not a problem to you, then you may want to give this room a shot. The software of 24hPoker did not pass our liking at all. First of all, there are some very serious stability issues which should not be neglected. The application does not handle large loads very well, and during our review, we even noticed that there are flaws with dual monitor support. The graphics are acceptable, but the way the lobby is built is simply unacceptable. For starters, there’s a lot of blank space for no apparent reason. We also dislike the tournament table, which opens up in a separate window. For some reason, the information is displayed in the worst thinkable manner. Despite this, 24hPoker managed to produce a great piece of software, except for its major flaws. Many functions are unique, such as automatic pot increases, auto check/raise functions which randomise the time before act, simply making it more random. Unfortunately, the big downsides help to bring down the score a lot, but solving these issues will make this software climb up quite a bit. 24hPoker is not a big player on the market, but the most recent TV promotions have led to some increases during 2005. The user traffic is usually above 2,000 simultaneous connections. At peak hours, this number increases to 3,000. Unfortunately, only one third of the traffic goes to tournaments. 24hPoker host a pretty solid list of tournaments, both scheduled multi tables as well as sit ‘N’ goes. The latter one supports turbo modes, heads-up games and regular games. Entry fees go from $1 and all the way up to $200. If you’re into World Series of Poker and European Poker Tour, you can also participate in qualifiers for $2 and up.5 buy-in to $100. On the other hand, most of these are focused primarily in Texas Hold’em flavours. 24hPoker support a lot of poker game types. The focus is on Texas Hold’em (Limit, No Limit, Pot Limit and Spread) but you can probably find a few Omaha and Omaha Hi/Lo games as well. Soko, 7 Stud Card, 7 Stud Card Hi/Lo, 5 Draw and 2-7-3 Draw is included as well. Unfortunately, these rooms are usually empty. Stakes typically range from $0.1/$0.2 to $50/$100. 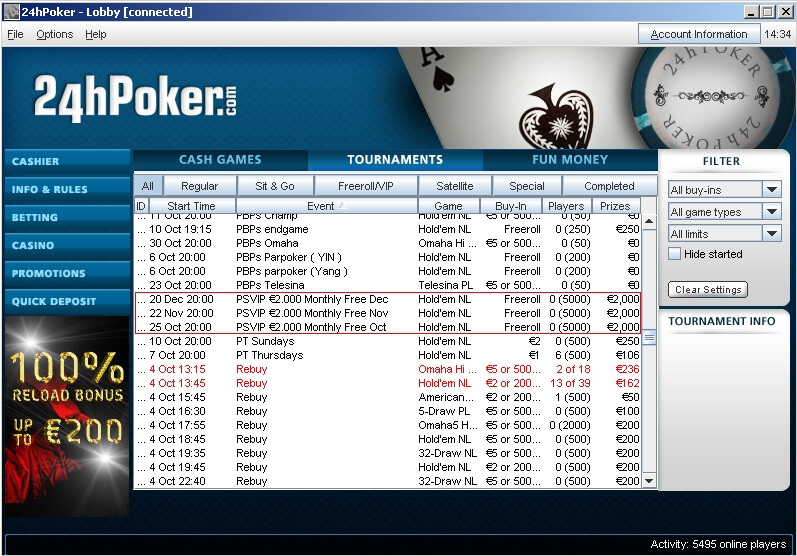 The 24hPoker network is usually cast on TV networks and magazines, which is a perfect way to lure fishes to your house. You won’t find much competition in the Omaha rooms, but what’s already there is usually quite average in terms of competition. 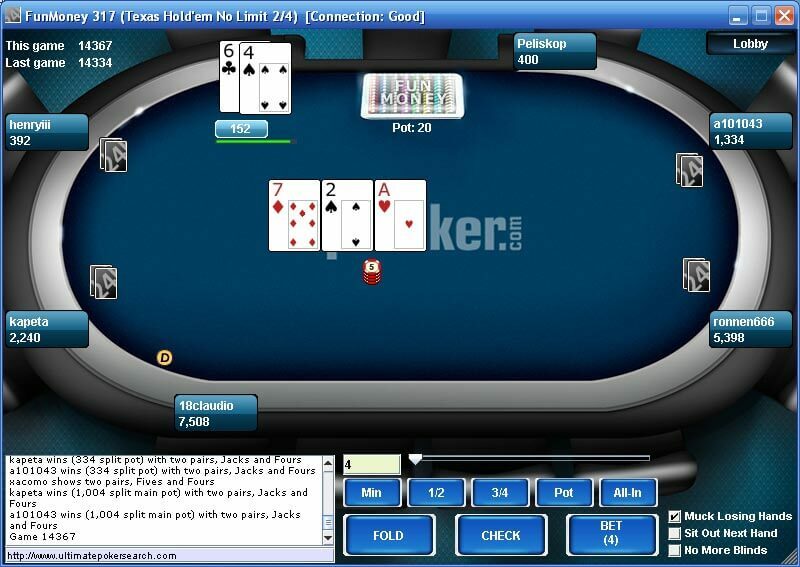 As for Texas Hold’em, you can find games with 80 % viewed flops even at $5/$10. The number usually stays above 50 %. The sign up bonus is 100% of your initial buyin if you use our 24hpoker signup code, up to a maximum of $1000 with 30 days to clear the bonus. To clear it you need to accumulate 200 VIP points per $10. This comes down to about 10 raked hands worth at least $0.50 each for each $1 in bonus. You are credited one VIP point for every $0.50 you generate in rake. These points are used for various activities, such as VIP tournaments (which require buy-ins unless you pay with VIP points) and more. 24hPoker usually offer daily freerolls ranging from $20 and up to $1,000. Some of these freerolls require a number of raked hands before you can get into action. Referring a friend is quite rewarding as you get $50 added to your account. This is slightly above the average, since most sites offer the same amount, although in USD. There’s also a bad beat jackpot which you can score by losing to a stronger hand. Support is only available by e-mail. Our tests showed that response times were adequate, usually within six hours. No live chat or telephone support is available. Deposits: Credit Card, NETeller, WebMoney and wire transfer. Cash-outs: Credit Card (refund only), NETeller, WebMoney, wire transfer and check.